Penny finally made enough money to get a ticket for the boat voyage back home and she was really happy to see all her friends again, but she was really upset when she saw that all the people there have stopped liking the same old foods. 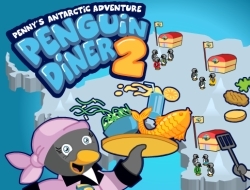 They had fish for breakfast, lunch and dinner for a very long time, so she thought that with her past experience as a waitress, she could open up her own place and make sure all the penguins get a nice meal every now and then at her new restaurant. All her clients must be happy with the services if you want them to leave a nice tip and you will make sure that no one has to wait for too long before they take a while. Use the mouse to help serve all the clients at your restaurant. Penguin Diner 2 7.33 between 0 and 10 based on 3 votes.